Should you buy your engagement ring from the big chain jewelry store or an individual goldsmith? The big chains have multiple locations and large jewelry collections. Jewelry designers with small businesses can offer personalized services not always available at larger businesses. While both types of jewelers have advantages, LoveToKnow Engagement Rings presents an interview with goldsmith Gaelen Van GorKom to discuss the special advantages of working with goldsmiths and selecting handmade wedding jewelry. LoveToKnow (LTK): What should couples consider when searching for a goldsmith or jeweler for their wedding jewelry? Refund: I offer 100% refund on all custom engagement rings. This begins from the design process right up through the finishing touches and even up until after 5 business days after the customer receives the ring (as long as it is returned in "like new" condition and with original packaging/documentation). Appraisal: I include an appraisal that itemizes the materials used and approximate replacement cost- for insurance purposes. Feedback: I allow for feedback, both on my personal website and on the Etsy site. Past transactions are transparent and speak volumes. LTK: You allow customers to order a ring based on an existing design, customize a design, or order a completely new design. What can customers expect from a custom ring order? Does a customer get a lot of input in the design process? If the customer has pictures (either ones of my own design, or others' designs) or elements they want to see incorporated into their own special design, the custom option is fairy straightforward. If the customer really doesn't know what they want, then I try to gently encourage them to use the internet and find ideas for a starting point. Next, I need to know their intended budget. If they are shy to give a number figure, then I usually shoot for the more expensive options and let them know there are ways to conserve money if the price ends up being out of their league. Rarely is the design expensive, it is almost always the materials chosen. The 1st rough draft doesn't look very rough….my software program makes very realistic photos of the "virtual" ring from all angles. 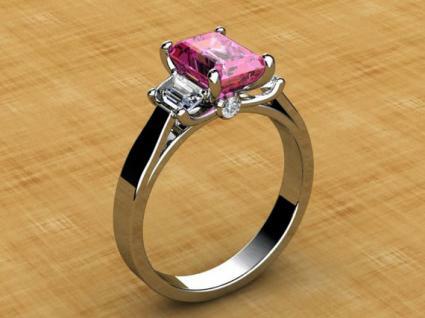 I can even put the ring on a virtual hand to help them see perspective on the stone size, etc. I can easily accommodate until the perfect design is born. If they want to see changes, or drastic alterations, often I end up emailing over 100x during the whole process. The design process can take up to 2 weeks, or as fast as 2 days. LTK: What is your advice to couples who are deciding between diamond and a diamond alternative like moissanite? GVG: I recommend that a couple focus on the design, and to spend their money in getting the look they want and can afford. If they can't afford the sparkly diamond, there is always the 5th or 10th anniversary where they can trade- up the moissanite for the real thing. I offer 100% trade up for anyone who buys a moissanite from me, and wants me to substitute it later for the real thing. LTK: What inspires your ring designs? GVG: I love flowing, organic lines. Nature is the best teacher, and we are placed in a beautiful world full of examples of colours and lines. Often customers have a pretty good idea of what they want, but usually I take some artistic freedom during the design process and put some of my expression into each piece. LTK: What type of materials do you commonly work with? Do you work with gold the most? GVG: I use platinum, palladium, as well as the various forms of gold (14k white, yellow and rose). I prefer each in their own way, as each metal has unique working qualities and esthetic value. I love diamonds and sapphires best, in regards to stones. These jewels are tough, as well as beautiful, with a wide range of street value- which is important when working within a customer's intended budget. LTK: Please describe the jewelry design techniques that you use. GVG: Last year I made the plunge into CAD/CAM technology; which uses computers to both design and to manufacture the rings. It took quite a bit of schooling and a hard learning curve, but now I have mastered it enough to produce not only realistic "virtual" rings, but also a perfect duplicate in the real thing. Gaelen Van GorKom grew up in an artistic family. He worked for years as a knife artisan creating handcrafted blades. When he met his future wife, he decided to make her engagement ring. The creation of his wife's ring led to his jewelry business, Wrought Gold, which specializes in handmade engagement rings and wedding bands. He has been designing rings for over 13 years. Based in Northern British Columbia, Canada, Gaelen sells his rings exclusively online through Etsy. Customers can purchase Wrought Gold rings at Gaelen's Etsy Shop. Gaelen also has an informational site to answer common customer questions and provide jewelry shopping tips at the Handmade Engagement Rings site.